I hope everyone had a wonderful Christmas. We had a great time and the food was so good. (Pat on my back for making my first Christmas dinner. I’ll post some of those recipes later.) We were pretty simple on our dishes, but the one thing that I really enjoyed wasn’t actually made by me. Andy wanted to have something to snack on, brought this recipe home and said, “I want to make this.” Which really means, “I want you to make this… Please.” And of course, knowing it was cheese and bread, I was on board. 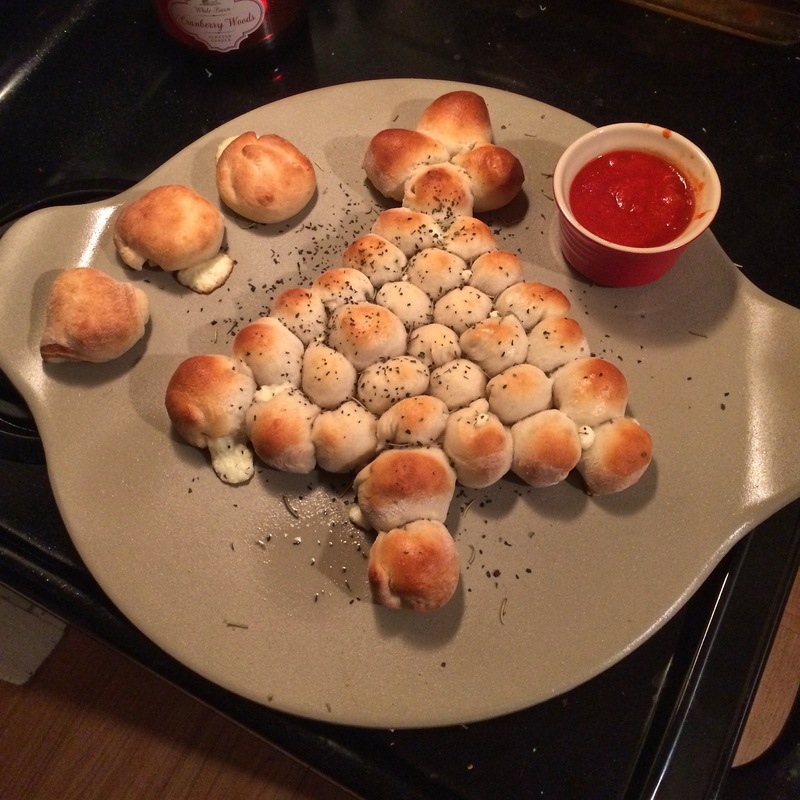 Come on, pull apart pizza bread. It has to be good. However, right before I was about to make it with him, I sliced my finger open with my new knives (Christmas present, I wasn’t paying attention.) So Andy was pretty much on his own (his mom helped, though). Between the two of them, they came out really good, and it even still looked like a tree! Heat oven to 400°. Lay pizza dough on a work surface and stretch to a 10 x 15 inches in size. Then, using a pizza cutter, cut the dough into 36 equal squares. In a small bowl, combine cream cheese and shredded cheese. Mix well. After removing pull-apart from the oven, brush with butter and sprinkle with herbs. Serve pull apart with heated marinara sauce.